If you're looking for toilet paper roll Christmas crafts that kids will love, this tree plaque is one of our favorites! Easy and fun. 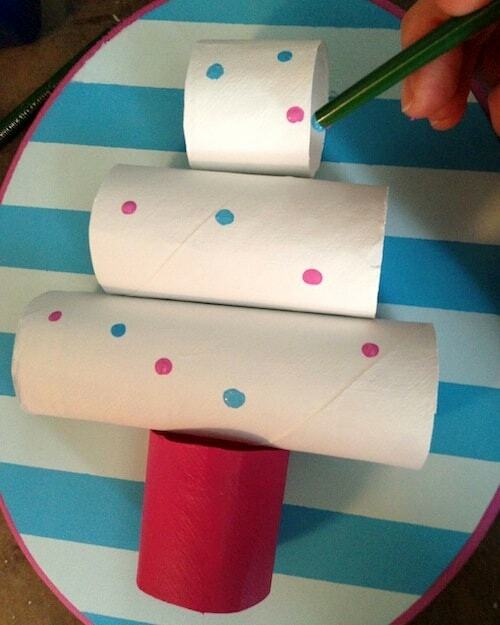 I'm a big fan of crafts with toilet paper rolls. I don't know if you saw my desk organizer? 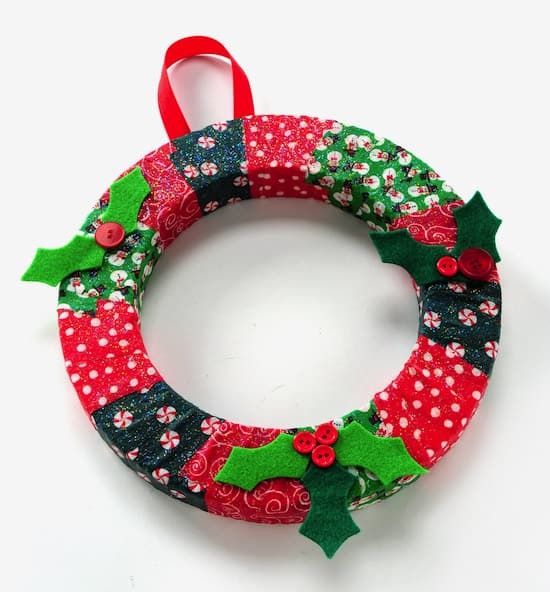 I feel very accomplished when I use TP rolls in my crafts, I guess because it can be hard to think of what to do with them. 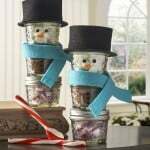 The truth is, this is a really fun holiday craft for parents to do with their children. Especially if the kids are younger, they'll need a little help. 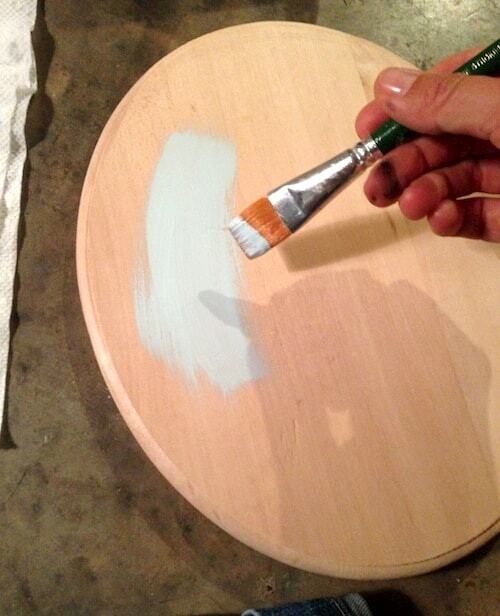 Older children will probably want to tackle this on their own and choose their own paint colors. But enough chatting, because I'm getting excited to share . 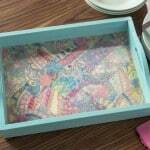 . . here's how to make this easy kids craft. Begin by basecoating the plaque with Cloudless. I love that name for a paint color, BTW. Let that dry until it's really dry. 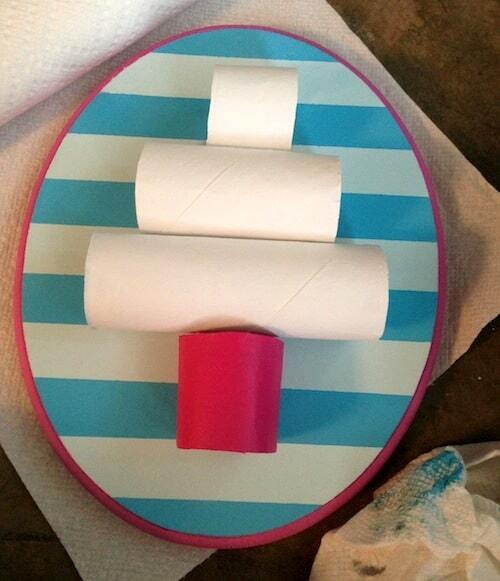 While the plaque is drying, cut your tp rolls into various lengths. 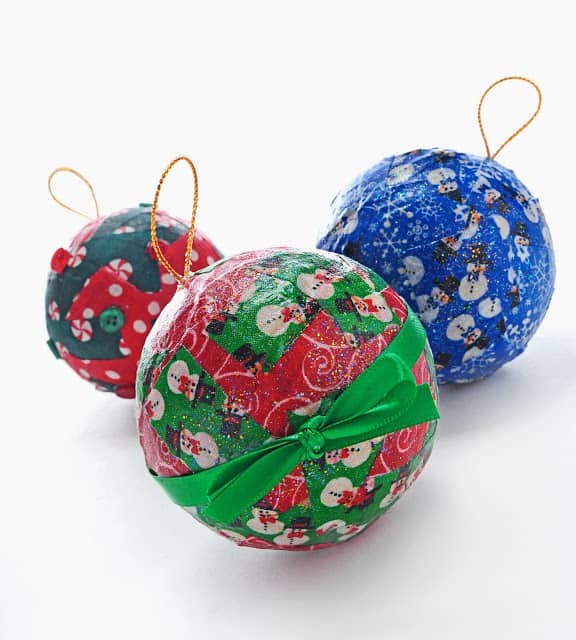 You want three for the tree top and then one for the tree base. I just eyeballed it. 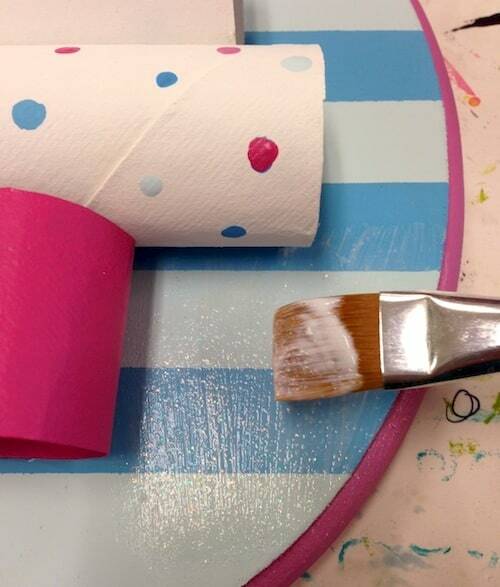 Paint the three larger rolls with White and the tree base with Bright Magenta. 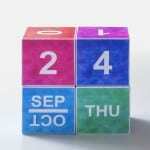 This is the part that older kids can handle, but you might have to help the young ones. 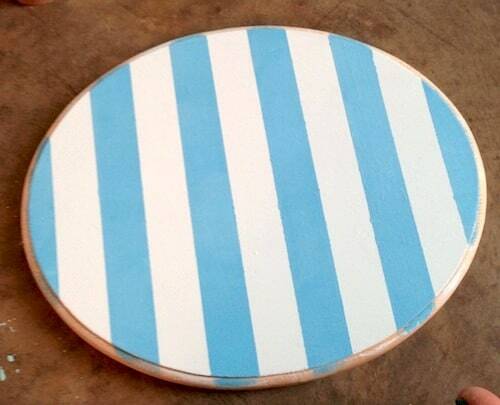 Make stripes on the back of your plaque with painter's tape and then paint over the top with Pool Blue. 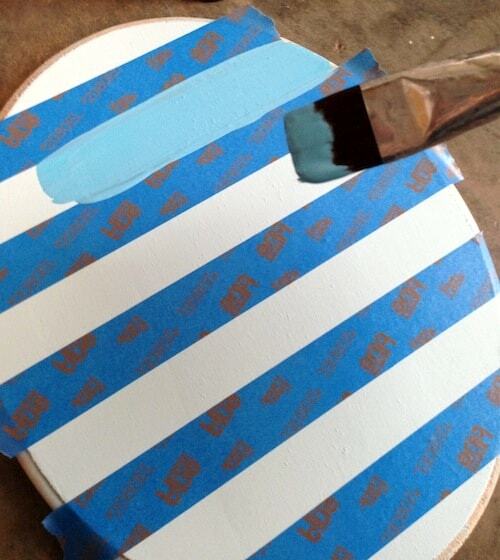 Remove the painter's tape immediately after painting. Here's your plaque after removing the painter's tape. Let dry . . . and then paint Light Pink around the edge. Let that dry. 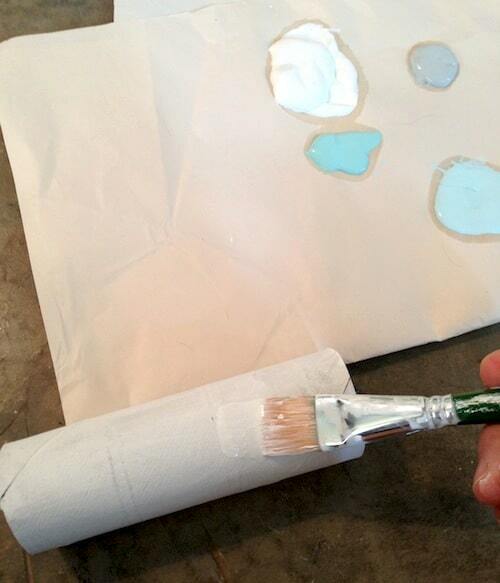 Glue your tp rolls down to make a tree using the craft glue. 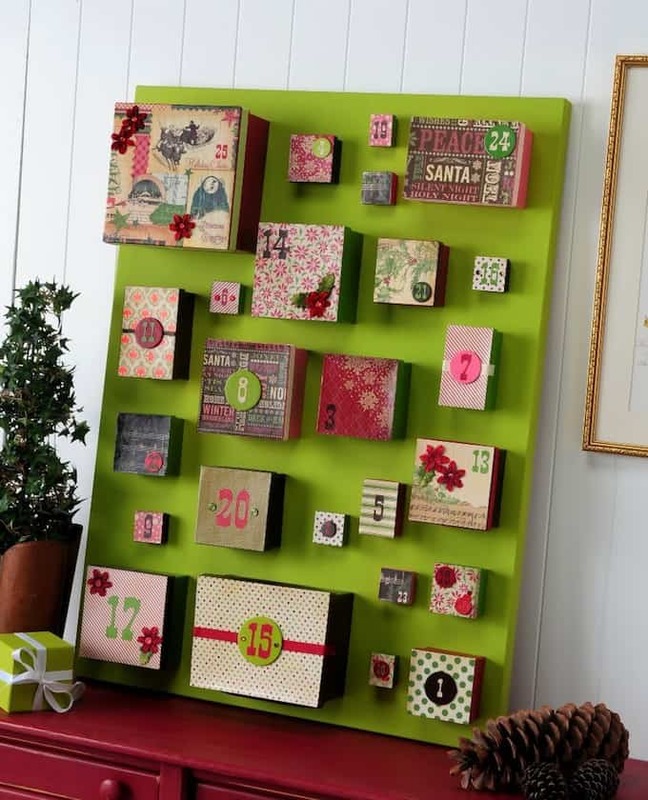 Then use your paint colors (including the ones you haven't used yet) to add dots to the “tree.” Just use the end of the paintbrush to make them. They don't have to be even. 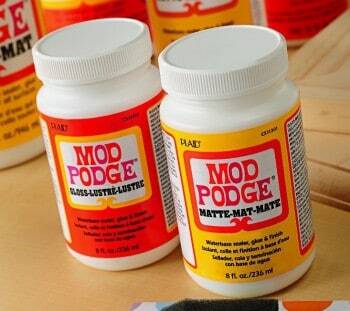 Paint the plaque with Sparkle Mod Podge. You can paint the tree too – it's up to you! I painted the whole thing. Hang and admire your toilet paper handiwork. Or your children's toilet paper handiwork. You know, whatever. Happy Holidays! Looks fantastic! 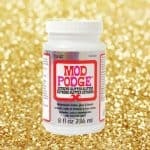 It’s also the first time I hear about mod pdge glitter, I will start using for my own crafts. Thanks for the tip! This is so cute! I bet my daughter would love this for her room! !